Wherever He Puts Us. . . Whatever It Takes. . . I saw something amazing while we were on vacation a couple of weeks ago. Lisa and I took an afternoon to explore Swallow Falls State Park near Deep Creek Lake in western Maryland with our friends Ray and Terry. The short trail that led to the falls wound through some woods populated by huge Hemlock trees, rolling terrain, and some very, very large rocks. Our little hike was filled with one awe-inspiring sight, sound, and smell after another. Then, I came upon something I had never seen before, or even thought possible. And it wasn’t just one thing. . . but many. 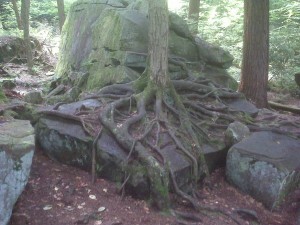 Scattered throughout forest were these trees that had somehow grown on top of some huge rocks. I thought about Jesus and the parable of the sower. Aren’t seeds that fall on rocky soil unable to grow? Still, somehow, someway, seeds had fallen on rocks and landed in very, very small, thin, and no longer visible layer of soil. Just enough to sprout. But in order to thrive and grow, the trees had to adapt to their surroundings by sending out their roots in multiple directions over the rocks and then down into the surrounding soil. Life, I think, is like that. Our sovereign God is in control of every minute and aspect of our lives. We are planted where He wants us planted. And, no matter where we find ourselves, whether it be times of plenty or want, we are to wholeheartedly seek to immerse ourselves in the fertile and life-giving soil of His word so that we might be nourished to grow and thrive. Somehow, this tree tapped into living water against great odds. Wherever He puts us, we must -with His help and by His grace – do the same. Whatever it takes, we must do the same. This tree reminded me of my need to fill my well with the water of God’s Word. It reminded me of my need to remind the kids I know and love to do the same. The abundant life will always be filled with great challenges. While we may be tempted to curse God, we must still seek Him. . . . delighting in and meditating on His word so that we might be like trees planted by streams of water (Psalm 1). What an amazing tree. What an amazing picture. What an amazing life! ← Ministering In The Midst of Pain. . . .
Oh yeah… there is such truth in this picture. Oh Father, may I grow and expand and yes, even bloom, in whatever soil you have placed me! There are challenges, yes, but they bring about a supernatural beauty- such as these roots over rocks- that make you pause and say “God is here.” May my life be like that! When unexpected accidents or difficulties strike, I often wonder, “What was he or she thinking about, or what was God teaching them, just before that happened?” and I pray that God will bring to mind those thoughts and truths throughout their time of pain or hardship. Walt, thank you for your faithfulness and your ministry and sharing it in this blog. I pray that you will stay rooted in God’s living waters and that he will bring full healing to body, mind, and soul.